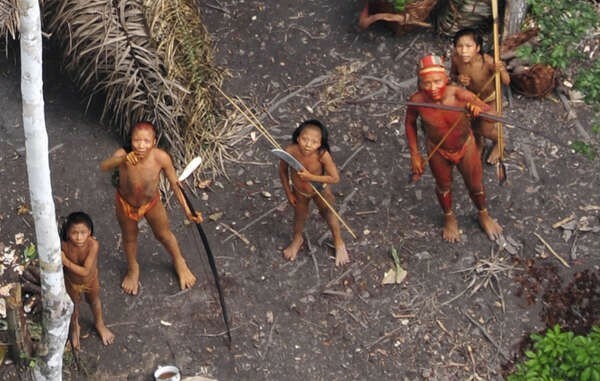 Public prosecutors in Brazil have opened an investigation after reports that illegal gold miners in a remote Amazon river have massacred “more than ten” members of an uncontacted tribe. If confirmed, this means up to a fifth of the entire tribe have been wiped out.Two gold miners have been arrested. Although I am not a full hearted supporter of DGR I am so grateful for the coverage they give to indigenous persons – if it weren’t for them we’d be nearly totally unaware of the atrocities that are happening such as this. Maybe some would rather not know, go ahead then – bury your heads in the sands – but that doesn’t make it any less real. This blog has quite enough on its plate dealing with environmental matters so tends not to share much about human tragedies. There is only so much pain and suffering one can bear to learn about and share. So for this crime there were few categories or tags available to label such an article. But there was one that fit; #Psychopaths seemed the right one. If we live in a world that allows this sort of thing to happen every day then we, as a species, have truly reached the end of our evolution and it’s probably for the best that we expire. At the very least we should drastically reduce our numbers. The greed that is at the center of such atrocities stems from a material based global culture which has infected humans completely. The USA has led the world population to this end. And although DGR likes to primarily blame white male patriarchy, women have played their part in this horrific greed culture as well. No one of us is blameless except perhaps these persecuted tribal peoples. Tears filled my eyes and rolled down my cheeks as I read this article simply because of the wrongness of it on so many levels. Somehow atrocity is not enough of a word to describe it. And I know that sitting in front of this laptop isn’t enough, I myself am not really doing my part to stop what is so horribly wrong with this and all the other massively fucked up situations happening around the world today. And that too causes deep hurt and regret. We, each of us, have to stop feeding the machine. We have to stop sharing these archaic values of wealth accumulation as the only ingredient of success with our children. We must – for our own salvation and sanity – find a new world order. What profound shame is upon you, Brazil and PMDB.